The Display toolbar lets you select the different Display nodes available in the node system. Harmony Advanced doesn't allow you to add Display nodes. The display selection feature is only available for the possible scenario that you need to use a specific Display node created by a Harmony Premium user. When your scene does not have a Display node, it is automatically set to Display All which uses the Timeline view ordering and shows floating nodes from the Node view. 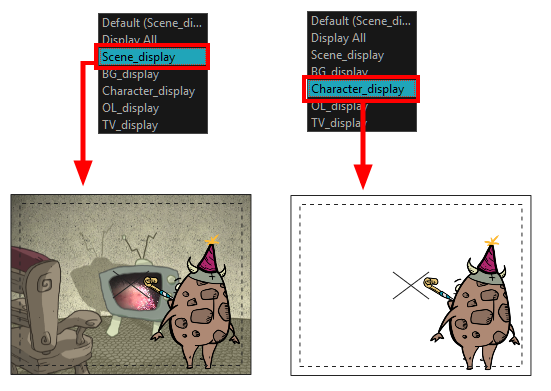 You can also set your scene to use Display All using the Display toolbar. NOTEIf you try to add a peg or other transformation layer in the Timeline view without having a layer selected, an error message will display. Make sure to change to Display All. The peg layer will be floating in the Node view and will not be visible in the Timeline view. The Timeline view shows only layers that are connected to the Composite node. If you switch to Display All, you run the risk of not realizing when you have floating nodes that are not connected to your composite. For this reason, it is not recommended to work in Display All mode. To learn more about the Display concept, see About Displays. Select Windows > Toolbars > Display.